You can add it to your wishlist and you will be notified once we receive a copy. 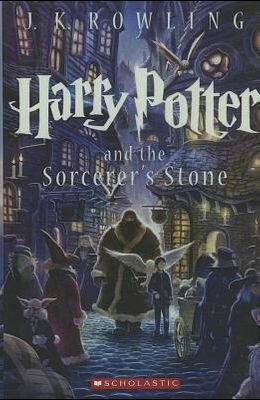 This special edition of Harry Potter and the Sorcerer's Stone has a gorgeous new cover illustration by Kazu Kibuishi. Inside is the full text of the original novel, with decorations by Mary GrandPre. Harry Potter has never been the star of a Quidditch team, scoring points while riding a broom far above the ground. He knows no spells, has never helped to hatch a dragon, and has never worn a cloak of invisibility. All he knows is a miserable life with the Dursleys, his horrible aunt and uncle, and their abominable son, Dudley -- a great big swollen spoiled bully. Harry's room is a tiny closet at the foot of the stairs, and he hasn't had a birthday party in eleven years. But all that is about to change when a mysterious letter arrives by owl messenger: a letter with an invitation to an incredible place that Harry -- and anyone who reads about him -- will find unforgettable. For it's there that he finds not only friends, aerial sports, and magic in everything from classes to meals, but a great destiny that's been waiting for him... if Harry can survive the encounter.